Twenty years ago, if you were sailing on pleasure yachts there was a big chance you would not find a VHF radio aboard. And when you could find one, it was big and you needed a training of a week to operate it. And now…. 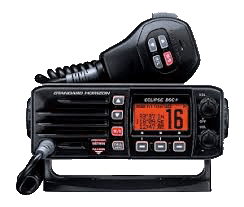 Radios have been updated with all the bells and whistles, loudhailers, foghorns, remote speakers/microphones, built in AIS, GPS, waypoints, digital compass, Digital Selective Calling (DSC) and Distress buttons. They can communicate over NMEA , are inexpensive and almost every boat, large or small, has a VHF radio installed. Even a paddle boarder can have a waterproof handheld VHF. We have a Standard Horizon GX2150 with AIS connected to a Garmin handheld 72H GPS. (on the moment we bought the radio they were not available with GPS) It is our emergency navigation system. If the main and very expensive navigation system fails, we can go on with these two stand alone devices.